Sir,– The Aboriginal Areas Protection Authority (AAPA) is calling for miners to respect the law and honour their agreements, following the historic prosecution of a Singapore-based mining company for the desecration of an Aboriginal sacred site. OM Manganese Ltd was today fined $150,000 in the Darwin Magistrates’ Court for one count of desecration to, and one count of damaging, the ‘Two Women Sitting Down’ sacred site at their Bootu Creek manganese mine on Banka Banka station, 170km north of Tennant Creek. At right: The site damage seen from the Eastern rim of the Masai pit looking across to the collapsed bull nose which includes the registered sacred site. Photo courtesy AAPA. Magistrate Sue Oliver said that OM (Manganese) had chosen profit before protection at its mine and had therefore contravened the NT Sacred Sites Act 1989. It was the first-ever case of desecration to be successfully prosecuted under Australian law and was a timely (and precedent-setting) reminder that poor management and the disregard for important Aboriginal sacred sites would not be tolerated by the law. Most miners in the NT, however, are operating in a responsible manner. Although Aboriginal custodians were greatly distressed by the site damage, they showed great faith in the court process and repeatedly travelled 1000km by road from Tennant Creek to attend the many hearings of the trial. Yet little could be done to rehabilitate the sacred site as it had collapsed after OM Manganese continued blasting and excavating ore next to it, despite knowing that a collapse was imminent. 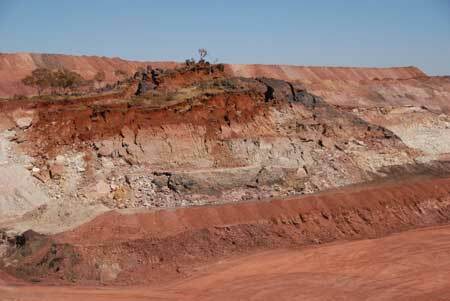 Ultimately, the site collapse totalled 17,000 cubic metres of ore, soil and vegetation. Under the NT Sacred Sites Act 1989 the site’s custodians are ineligible for any compensation and fines would go directly to the Northern Territory Government. When a sacred site is desecrated or damaged it tears the social fabric of the affected community as the harmony of those people is inherently linked to that sacred site. Sacred sites are important to all Australians as most of this nation’s cultural integrity, historical significance and tourism appeal comes from the 50,000 years that Aboriginal people have been caring for their country, their seas and their sacred sites. This site has great significance to the custodians and relates to a dreaming story about a marsupial rat and a bandicoot who had a fight over bush tucker. As the creation ancestors fought, their blood spilled out, turning the rock a dark-red colour that is now associated with manganese. Most Aboriginal people are not ‘anti-mining’ but they do insist that their sacred sites be protected: AAPA is the first point-of-call regarding the protection of sacred sites for anyone wishing to mine or develop lands or seas in the NT as we have, with the custodians, recorded where the sacred sites and significant places are, across the Northern Territory. Aboriginal landowners can now thank the Darwin Courts for setting precedence for the desecration of sacred sites. Mining companies are invited to perform a cost-benefit analysis next time the irreplaceable social fabric and cultural integrity of Aboriginal sacred sites comes between extending their already extraordinary profits. A financial penalty of $150,000 is petty cash to the OM Manganese Mining Corp! Further this money is awarded not to the landowners but to the NT government, who with the assistance of the Northern Land Council, encourage Traditional Owners to approve mining leases on their land. Conflict of interest much? When 80% of the NT’s current mining activities are conducted on Aboriginal land, this can hardly be seen as a victory. OM Holdings Limited (“OMH” or the “Company”) notes today’s ruling handed down in the Darwin Magistrates Court against OM (Manganese) Limited (“OMM”), a wholly-owned subsidiary of OMH. The decision relates to claims filed by the Aboriginal Areas Protection Authority (“AAPA”) in respect of damage to, and alleged desecration of, the Two Women Sitting Down sacred site within the boundaries of OMM’s Bootu Creek manganese mine near Tennant Creek. During the proceedings OMM pleaded guilty to one charge of damaging the sacred site. The company contested the charges of desecration. It argued that it had no intention of damaging the site. The Court today found OMM guilty under the Northern Territory Aboriginal Sacred Sites Act (NT) of one count of desecration on the basis that the possibility of damage to the sacredness of the site was a foreseeable consequence of its mining activities. The other charge of desecration was dismissed. There was no finding that the Company intended to desecrate the site. A financial penalty of $150,000 was awarded against OMM, $120,000 on the first count and $30,000 on the second. Commenting on today’s decision, OMH Chief Executive Officer Peter Toth said that OMM accepts the Court’s ruling and deeply regrets the damage caused. “The company never intended to harm, damage or disrespect the sacred site. We sincerely regret the damage and the hurt caused and I unreservedly apologise to the site’s custodians and traditional owners,” he said. “While OMM encountered unexpected ground conditions in the Masai Pit, it is clear that our pit design and mining activities contributed to the damage at the site. As soon as that damage was identified we executed a comprehensive remediation plan, including ongoing monitoring, which helped to secure the site and prevent further damage,” he said. Mr Toth said OMM had consulted with the Northern Land Council, AAPA and the NT Department of Mines and Energy from the time the damage was discovered until the remediation of the site was completed. “OMM has been mining at Bootu Creek for more than six years,” he said. “Our intention was and remains to protect and respect the site at all times. The lessons learnt from this incident have been fully incorporated into OMM’s mining practices,” he added. “We have built an excellent relationship with the traditional owners and made a positive contribution to the local community. We will continue to engage in an open and constructive way with the traditional owners and other local stakeholders going forward,” Mr Toth concluded. An excellent landmark decision. Respecting the traditional rites and rights of the people is paramount. Though the fine imposed was less than a third of what it could have been under the terms of the Act, it was the decision that has made history. Mining companies have a duty and responsibility to adhere to the agreements entered into. As the industry evolves, there are some very dubious practices involved in extracting materials being utilised. Fracking as a practice has been banned altogether in France and other places around the world. It has also had drastic impacts in Pennsylvania. Future agreements with mining companies in Australia must exclude that practice where it threatens water supplies and people’s livelihoods. Congratulations to the traditional owners and the Aboriginal Areas Protection Authority for pursuing this case against OM Manganese Ltd to a just conclusion. Let us hope that the mining company doesn’t waste more time and resources appealing the Magistrate’s clear decision. AAPA has shown here that it is able to make use of the NT Sacred Sites Act 1989 legislation effectively to protect sites that are important to Aboriginal people, and this should make many mining companies and other developers sit up and take notice, and behave carefully and properly when they are given permission to work in the vicinity of sites that are important to traditional owners.